A little bit of digging has brought me the picture i’m about to share of the My Father “S” Special. The packaging indicates that these will be released in packs of 3, further digging indicates that these will be given out at events with box purchase. 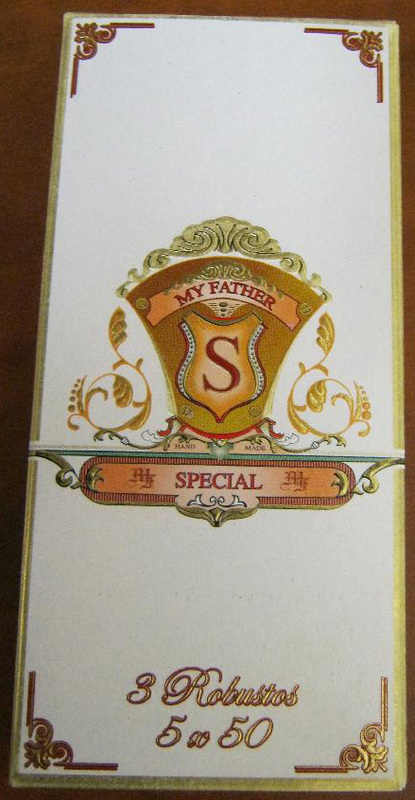 Additional info: The My Father Special is based on the Centurion blend. Some of this info was found on my own, additional info was pulled from Barry’s Review. Thanks to Barry for the blend and strength info, check out his review for additional pictures and info! This entry was posted on March 14, 2011 at 8:47 am and is filed under Cigars with tags 5x50, centurion, Don Pepin Garcia, DPG, gift, medium, MF S, MF Special, My Father, My Father S, My Father Special, Nicaragua, robusto. You can follow any responses to this entry through the RSS 2.0 feed You can leave a response, or trackback from your own site. no pictures of the cigar?? had one last night not bad but compared to the other My Fathers it lacked a lot. I haven’t come across these yet though I saw them in the cigars.com catalog that showed up yesterday that they’re included free when you buy a box of Le Bijou 1922’s. This was a test I was doing of culling info from the web and putting a quick post with pictures together. In the future I may revive the idea but for the time being it is a concept i’m letting fall by the wayside.